I have been walking by the movie My One and Only at Blockbuster for months now and I finally picked it up to watch. 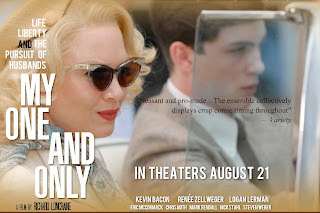 I knew it was a film set in the 50s and based loosely on George Hamilton's life (yes, sun-tanned, Love at First Bite George Hamilton). Other than that I didn't know what to expect. Anyway, I ended up loving it and so did the husband. 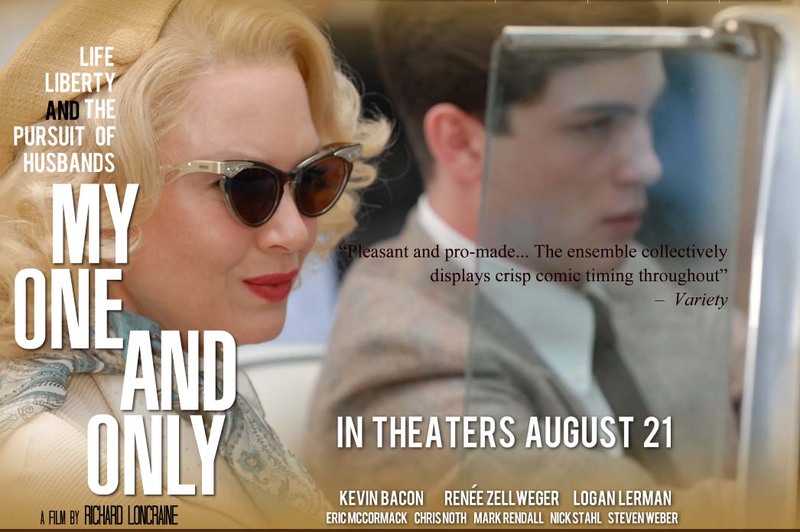 Go rent this movie. You'll thank me for the fashion and the beautiful caddy shots at the very least. My very favorite clothing piece is the off-white bolero sweater. I have these darling Steven Troy Troylings label peep-toe shoes in a size 7.5 or 8 narrow (modern sizing) for sale in my etsy shop Tart Deco. To celebrate Memorial Day weekend, I am listing these shoes at a special low price of $36, starting today and ending June 1st. Similar shoes online (in smaller sizes) are going for $50-65, so don't let these cuties get away! For more details, visit my shop here. 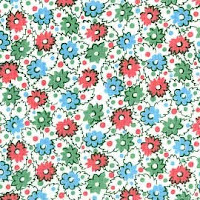 Labels: 40s WWII, fashion, Tart Deco, What's on Sale? These Shabby Apple swimsuits are super cute! I love this one in red. There are also a couple cute striped ones too. If you would like to win one of these beauties, head on over to Grosgrain Blog via the link above. Good luck! This is a post for all of my readers who sew. 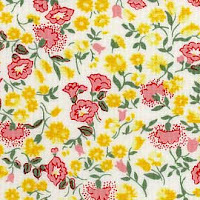 If you are like me you love the look of a vintage fabric but know how hard it is to find something vintage that is enough for a whole project or is in decent shape (not brittle). 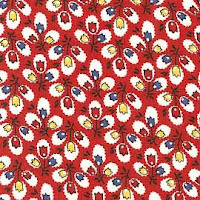 I came across the website Reproduction Fabrics that has amazing fabrics at amazing prices, many under $10. The time line starts at 1775 and runs to the 1930s-50s. They also have this fun tool called the Fabric Play Station where you can see how the fabrics in your shopping cart look together, which is pretty handy. Hey Kittens! Brittany at Va-Voom Vintage has put together a nice little tutorial on how to pluck your eyebrows for a vintage look. While you are at it, check out her other tutorials. Hello Cats and Kittens! I am feverishly studying for one more exam tomorrow then I am done with the semester! WOOHOO! I know, I know... why should you care? Well, for one- you like me :) For two, that means new vintage blog specials, new creations for my shop and- here's the biggie- a giveaway! I will post more in a few days after my exam and a date with a celebratory bottle of Shiraz! YUM! 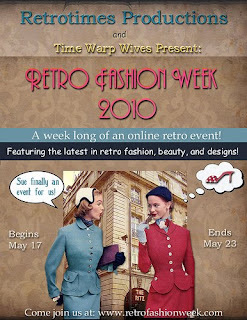 Just a reminder, Retro Fashion Week starts today. This is an event online with tons of different resources. Please visit! 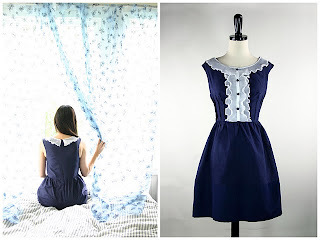 One of my favorite sewing blogs Grosgrain has started a new series called Frock by Friday where she (and her readers) create a new frock in a week and she walks you through the steps. The best part? 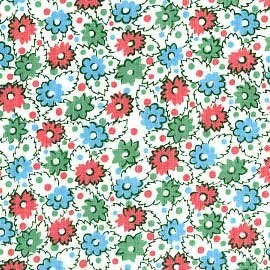 She uses patterns that are available for free! 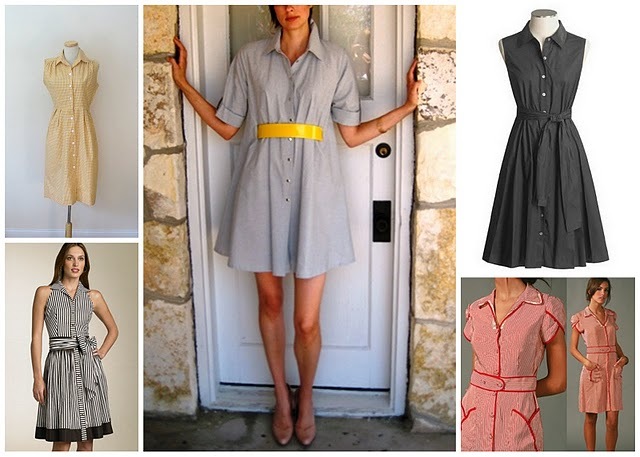 You all know how much of a fan I am of the classic vintage shirt dress? Well, right now she is making a shirt dress. RUN, don't walk, and join the fun! 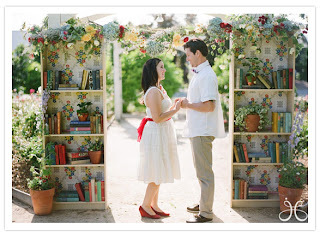 I was turned onto this amazing photoshoot of a literary-themed wedding by Pink Cupcake Vintage Blog. If you like the vintage cupcake liners, there is a link on Pink Cupcake for a tutorial by the cake designer. Welcome to Deluxeville is having a monster of a giveaway! 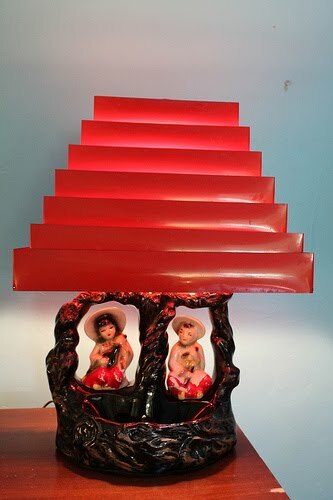 So if you feel lucky and want to win this lamp, scurry on over and throw your hat in the ring! Grosgrain Blog is giving away this adorable dress. Doesn't it look like something Audrey Hepburn would wear? I love it and wish I fit into it, but alas, most of the dresses given away by this talented blogger are made for her size, which is a 4-6. So if you are that size, go enter! Let me know if you win. After deliberating for a year, I have decided to sell my wedding dress. There are a few reasons for it, but mostly because I'd like someone else to be able to have such a cute custom dress in a harder to find plus-size. I have also decided to use the proceeds to visit my dad in AZ while he is on chemotherapy for colon cancer. 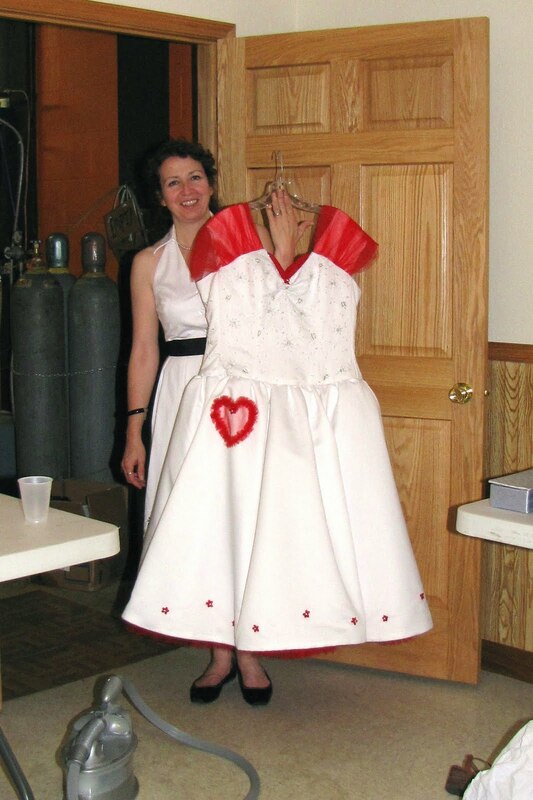 This dress was designed by me and fashioned by my aunt who is a fashion designer and used to have a bridal shop in L.A., so it is high quality. As an extra bonus, it is eco-friendly as it was made by combining 2 never-used thrift store dresses. 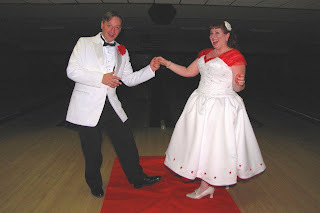 A few details on the dress- the dress has a built-in crinoline with a red tulle ruffle that peeks out at the hem, but I also wore an additional red crinoline underneath for extra fluffiness. 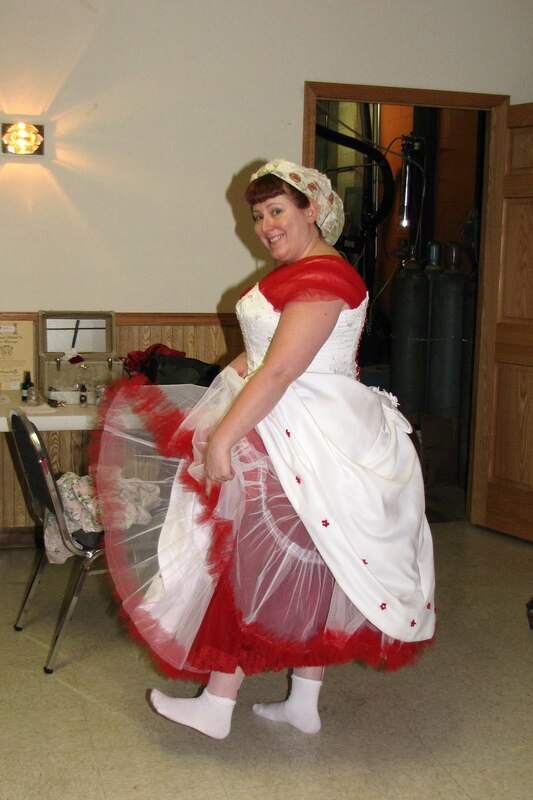 I have to be honest though, its pretty good without the extra crinoline. There is a cute red heart on the skirt which is actually a working pocket for a hanky. The red tulle at the shoulders can be removed and switched out for white, or you can just have the plain straps. 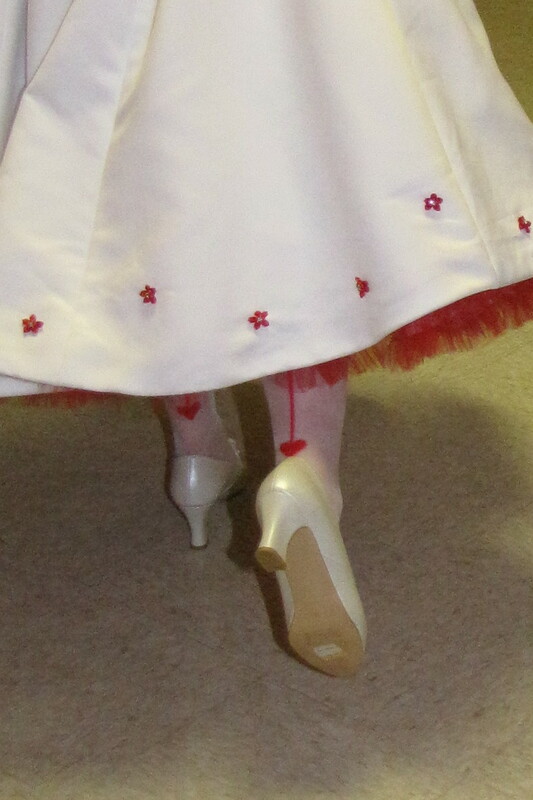 The trim you see at the bottom of the skirt are tiny red ribbon flowers with rhinestones in the center. 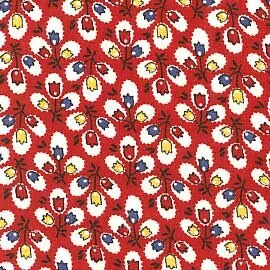 The same red flowers are attached down the back of the bodice by the zipper. The bodice is lined and has beading and rhinestones all over it and there is a big white bow that sits at the bottom of the waist in the back (which can also be removed). I also have a matching vintage 50s bandeau bow hat and a detachable cathedral length veil (with a row of red tulle that matched the dress).I would prefer to sell with the dress, but am willing to entertain offers for it to be sold separately. Please contact me through email if you have any questions or would like to make an offer. 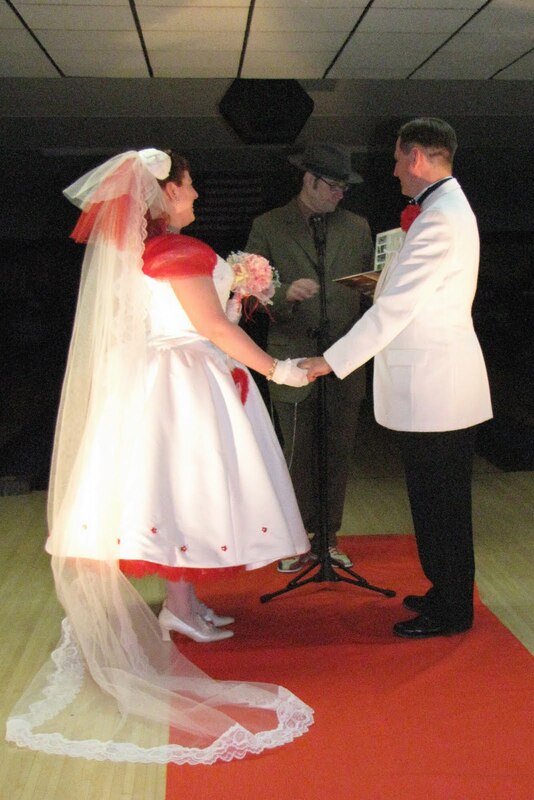 EDIT: As of 7/20/11 the dress (with veil) is still available. I have decided to sell it for $400 or best offer. 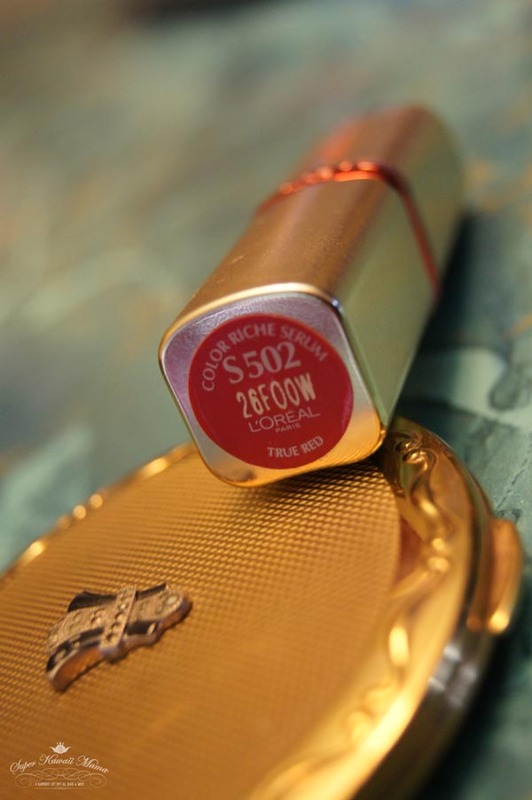 Visit her nifty blog for some great outfit posts and other vintage tidbits. She is a rockabilly gal to boot. So stop on by and say howdy! 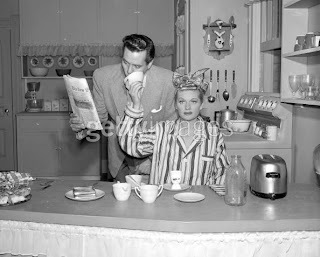 I was watching episodes from the first season of I Love Lucy the other day and I noticed that they were eating an egg out of those cute little egg cups. I also noticed that they had very little else on the table besides coffee and toast. 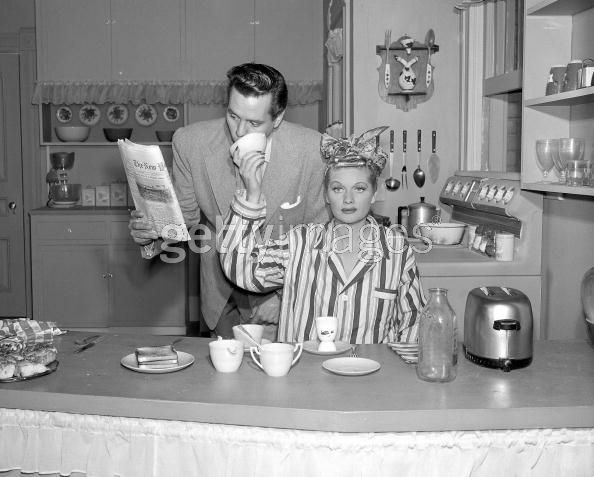 This got me thinking, was this a TV breakfast or a typical 50s breakfast? 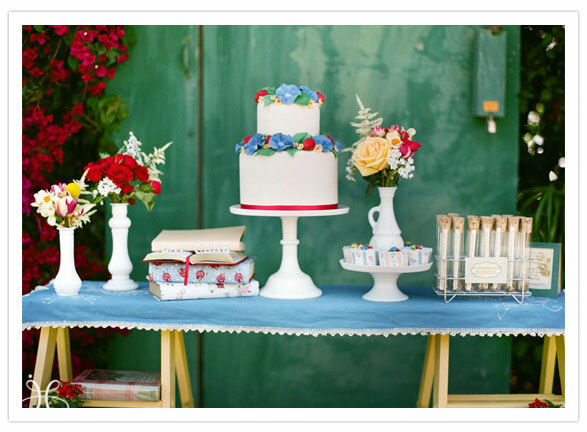 So I got online and procrastinated even more from writing the paper that is due on the 10th and found this interesting website- The Food Timeline: popular American decade foods, menus, products & party planning tips. The site gives you great info on food by decade starting from the 1900s, plus some on the UK and Australia. For instance, did you know that Taco Bell was established in 1951? Neither did I.
I just happen to revisit Pacificplex.com today, but found that they have a larger selection of dresses on amazon right now. 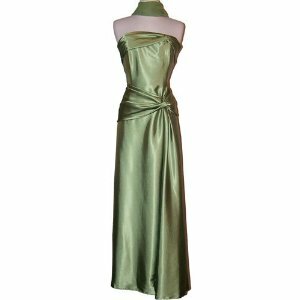 In fact, there are a bunch of dresses that could easily be used as bridesmaids dresses since they are available in multiple sizes, sometimes even up to 5x. AND most of the prices fall below $100. I can't vouch for the quality, but I'm pretty sure they'll last through the wedding day (or prom). I also saw a few dresses that could be used for the bride. 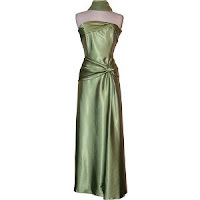 Most of the dresses that were vintage inspired were in 30s-50s styles, and some had multiple colors. The dress pictured in this post is available in 10 different colors (including ivory and white) and is $69.99. Labels: 20s 30s Flapper, 40s WWII, 50s Rockabilly, fashion, Vintage Wedding, What's on Sale? Interested in reading Good Housekeeping magazine from 1885-1950 for free? I thought so. Home Economics Archive has every complete issue from these years available online, including ads (in black and white only).